Rongrong Wang was a graduate student at the University of Maryland under the direction of John Benedetto and Wojtek Czaja. She earned her PhD in May 2013 and was then a Postdoctorate Research Assistant at the University of British Columbia. She is now an Assistant Professor at Michigan State University. 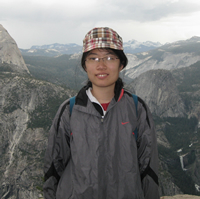 Her thesis title was "Global geometric conditions on sensing matrices for the success of L1 minimization algorithm".